Seattle artist Francis Celentano’s latest exhibition The Gemini Series presents mesmerizing images that further cement his position in the history of and resurgent interest in Op Art. 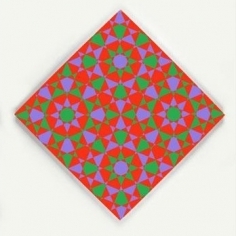 In this show, Celentano’s acrylic paintings involve the concept of overlapping two identical patterns, and reorienting. He explored the pattern relationships initially using a computer program, and then migrating the designs to his paintings. The series evolves from the intersection of grey and white patterns, to a transformation through a variety of color ranges including blues, greens and reds. As a whole, The Gemini Series of fused patterns generates a dramatic tension in a variety of ways expressed differently by each painting. Celentano moved to Seattle from New York in the 1960s to become Professor of Painting at the University of Washington. It is here he began to develop his interest in color theory. Rather than using color in a traditional manner, in depicting something else, he immersed himself in its theories, developing ideas in hard edge painting and optical art. Resonance can be found between his work and that of other notable Op artists like Bridget Riley and Victor Vasarely. After receiving his MA from New York University in 1957, Francis Celentano studied in Rome with a Fulbright in Painting at the Academy of Fine Arts. He has exhibited work since 1958. 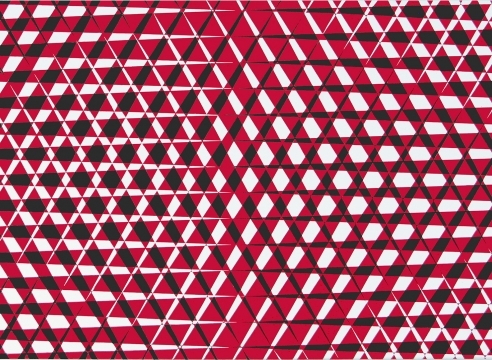 Recently, his work was included in two major exhibitions examining the Op movement of the last century, Optic Nerve: Perceptual Art of the 1960s, at the Columbus Museum of Art, Ohio, and After Image: Op Art of the 1960s, Jacobsen Howard Gallery, New York. His work is in numerous collections including The Museum of Modern Art, New York; Seattle Art Museum, WA; Stedlijk Museum, Schiedam, Holland; Rose Art Museum, Brandeis University, Waltham, MA; Albright Knox Museum, Buffalo, New York; and the Henry Art Gallery, University of Washington. The Hallie Ford Museum, Willamette University, Salem, OR presented a major retrospective of Celentano’s work in 2010. Now in his mid-80s, Celentano is going strong, with a gorgeous suite of paintings on geometric canvases. This work is so confident, so virtuosic, so defiantly superficial, it shows that Op is more relevant than ever in this time of bold colors and visual illusionism in video games, advertising and design.